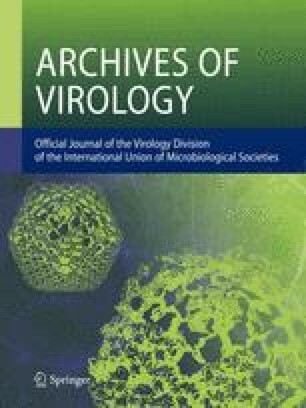 Recombinant DNA techniques were used to insert foreign genes into bovine herpesvirus-1 [infectious bovine rhinotracheitis virus (IBRV)] vectors which were attenuated by deletion and/or insertion mutations in the IBRV thymidine kinase (tk) gene. In one recombinant, the regulatory and coding sequences of the late pseudorabies virus (PRV) glycoprotein gIII gene, were inserted into the early IBRV tk gene. This recombinant efficiently expressed the PRV gIII gene indicating that immediate early IBRV proteins were competent to transactivate the late PRV gIII gene. IBRV vector viruses were also prepared in which the coding sequences of the early PRV tk gene, the late PRV gIII gene, and theE. coli β-galactosidase gene were ligated to the late IBRV gIII promoter. Genotypes and phenotypes of the recombinant viruses were verified by restriction endonuclease and molecular hybridization experiments, thymidine plaque autoradiography, β-gal plaque assays, and by immunoprecipitation experiments on extracts from3H-mannose-labelled cells. The recombinant IBRV expressing β-gal from the IBRV gIII promoter has been useful as an intermediate in the construction of IBRV vectors harboring foreign DNA sequences. The infectivity of the IBRV recombinant that expressed PRV gIII from the IBRV gIII promoter, was neutralized by polyclonal PRV antisera and by monoclonal antibodies to PRV gIII. The PRV gIII glycoprotein synthesized by the preceding recombinant has been used to coat microtiter test plate wells in a PRV gIII differential diagnostic test kit.